Why Making Dots Is Important and How Connecting Them Might Save You In the Future. I have been reflecting on my life’s journey very intensively these days and I am deeply grateful to all ” five lives I have lived.” What do I mean by it? During each of these lives, I have made dots. Dots, which might have no major significance at the moment when they happened, but they have gained its importance later in my life. Let me share with you, one such story of connecting dots from my early days in Dubai. When I have quit playing basketball in February 2002, I was devastated by this major change and shift in my life and I have wondered at that time, what for did I dedicate my life to this game? The answer came 2 and half years later and I have clearly understood its meaning only now, 8 and half years after my end of professional basketball career. Thanks to my passion – basketball, I have met 3 amazing people in Dubai, who have helped me to made it through first 6 months in this country. 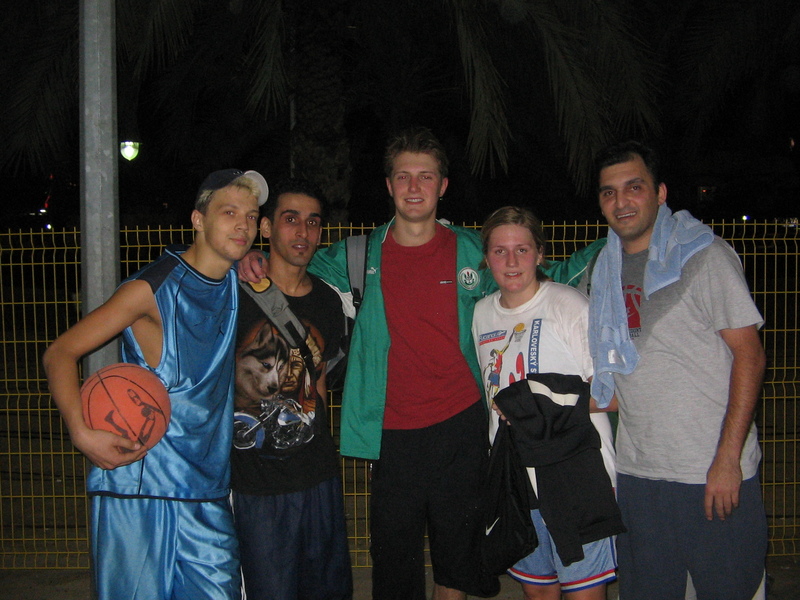 You can see them on the picture: Al (young man from Lithuania in blue t-shirt with hat), Ali (from Iran next to Al in black t-shirt) and Mazi (gentleman from Iran on my left with towel around his neck). Our friendship has tremendous value for me. And, I would have never been able to know these; for me “saint like people” , if I would not have played basketball before. When my 3 months internship ended and I had no place to stay, it was Mazi, who has offered me a shelter and for 2 and half months, I was grateful for a place to sleep and live (mat on the floor of Mazi’s room). This is how my basketball dot in the universe saved me from being homeless. It did not make any sense in 2002, but it is just one “heck of a lesson learned” in 2010. Al, Ali and Mazi: THANK YOU! Dear SCG, how many lives have you lived? What dots have you already connected? What you do to see Al, Ali and Mazi again? Did you have time to say thank you and show them how grateful you are? Oh, yes I am in touch with Al and Ali quite regularly and I exchange email from time to time with Mazi as well. Great story. The multi-life-in-the-same-life metaphor is always “in orbit” to stories of real change. Many thanks for your blog about me and also us. I am happy to support you in that time and also for me, that time was one of the great moments in my life. Aaaw, Mazi! Wow, how great to see you here! Thank you so much for your words! Yes, those were the most precious moments of my life as well! For such memories, it is worth to live life! Say hi to your wonderful family in Teheran!